Texture is an important attribute in that it affects Research, processing and handling; influences habits; and affects shelf-life and consumer acceptance of products. Texture Analysis has become very adaptive in many industries to measure a specific or range of characteristics or properties relating to the way a material behaves, breaks, flows, sticks, bends, etc. Researchers and manufacturers routinely apply texture analysis techniques in new product development as well as part of quality control at various stages of manufacture, carrying out a wide range of measurements to analyse raw materials, excipients, semi-finished goods, packaging and finished products. It is a well establishedcost-effective technique to determine the effects of raw material or excipient quality or the adjustment of formulation or processing variables on end product desired quality and acceptability – whether this is to measure the 'mouth feel' properties of food, the flow properties of creams and pastes, the break or bend of a product or the tackiness of adhesives. Where problematic textural issues occur during storage, transportation or as consumer complaints, texture analysis can provide a useful assessment. It may also prove to be an effective means of comparison with competitive products or where claims substantiation is necessary to take a technical pro-active stance in your market. It will certainly prove an indispensable tool when you need to quantify the texture or overall physical properties of your 'gold standard' product for future comparison in manufacture – the key to maintaining consistent textural quality! Stable Micro Systems (SMS), UK, world leader in texture analysis, offers the 'World Standard' Texture Analysers to completely satisfy the increasing demands for accurate, repeatable and quantifiable textural information. It measures textural properties by capturing force, distance and time data which is displayed graphically by Exponent software in real time. 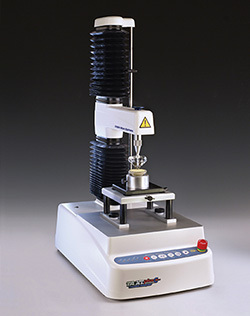 In a simple test, the arm of the texture analyser containing the loadcell moves down to penetrate or compress the product, and then returns to its initial position whilst measuring forces in both directions. Many texture analysis tests, such as the Bloom Strength test for gelatin gels (GMIA), Bread firmness (AACC 74-09, AIB Standard), Pasta firmness (AACC 16-50),Packaging film stickiness and friction (ASTM D1894) are International Standards, whereas others are recognised as standard tests within an industry, such as Texture Profile Analysis, back extrusion test, and TTC spreadability test for many food products. To be successful, all of these tests depend upon the integrity of the Texture Analyser and the selection of the correct testing method, the manufacturing precision of the probe or attachment used and the accuracy of the analytical software to provide the results in a clear, concise format. SMS Texture Analysers with its wealth of application methods and the range of over 200 probes and attachments are world best Texture Analysers, andis the result of decades of experience in the research, design and manufacture of this equipment. The choice of probe or fixture that you use will depend upon the sample's form, the property that you wish to measure or the action that you wish to perform. The software with SMS Texture Analyser (Exponent/Exponent Lite) has excellent Application studies in its library which include guide for probe/fixture to be used, setting, sample test results, and result interpretation which keeps us much ahead of our competetors. Fixtures for all kind of products are available to provide the required action of compression, extrusion, cutting, extending or bending on the sample or to support, anchor or deform the sample in a customer-specific way. The main goal of many texture studies is to devise one or more mechanical tests with the capacity to replace human sensory evaluation as a tool to assess texture. Measurements that yield both fundamental and empirical product characteristics are well developed, whilst wide-ranging imitative test procedures are also becoming increasingly important. Their relevance is in imitating a real-life situation, which permits far simpler data interpretation. Sensory analysis includes use of the senses of smell, taste, sound and touch. Evaluation of food, pharmaceutical and cosmetic texture by touch includes the use of the fingers, as well as the lips, tongue, palate and teeth in the mouth. As would be expected, sensory methods of analysis are subject to wide variability, are labour intensive and therefore expensive. Instrumental methods of assessing texture can be carried out under more strictly defined and controlled conditions. Problems of experimental variability are more likely to be caused by sample heterogeneity than by instrumental imprecision. Another reason for instrumental analysis may be that often changes in ingredient levels cause several simultaneous changes in product characteristics. Some of these changes are difficult to mask and thus tend to make sensory analysis difficult. We can all feel it – let us show you how to measure it! As attendees at each annual AACC, ICC and IFT meeting, as well as being members of Campden BRI's Cereals, Milling & Baking Panel, we are sure to be abreast of the requirements of the industry and our customers. Over the years we’ve worked with top scientists and companies in the field to develop such fixtures as the Kieffer Dough & Gluten Extensibility Rigand the Warburtons Dough Stickiness Rig. Whether it's pillowy fondant, sticky caramel, gooey chocolate spread or glossy glazes, today’s consumers of confectionery want it all, demanding products that deliver on taste and texture alike. Extra crunchy, super crispy – texture descriptions on new products have become more elaborate over the last couple of years, along with the increasing use of superlatives to convey the ultimate texture experience. It’s not just the words that are getting more elaborate. Visual texture descriptions are also receiving more prominence on packaging, while the size of the texture-evoking words is also increasing. Texture has become more dominant due to bigger inclusions such as chunks, clusters and nuggets, more innovative shapes have evolved to help achieve extra crunch or improved taste and the idea of providing a multitude of textures all at once, such as chewy, smooth and crunchy. The myriad of ingredients available to formulate such texturally amazing products is endless. Once designed, however, the texture will need to be quantified because, after it’s bought and favoured, any new confectionery product will then survive only as long as the manufacturer is able to provide it at consistent quality to meet the consumer’s expectations. A wide range of CONFECTIONERY PRODUCT test methods is built into Exponent Texture Analyser software and will automatically load at the click of a button. We help make your testing quicker to access and the analysis of your product properties already prepared for you. Over the years, we’ve worked with top scientists and companies in the field to develop such fixtures as the Flexible Substrate Clamp for measuring sweet wrapper release and the Acoustic Envelope Detector for the extra dimension of sound measurement. No one knows more about the texture analysis of confectionery products – but don’t just take our word for it, read an example of what our customers have to say. When a test solution doesn’t exist, we go ahead and develop it – the Cheese Extensibility Rigand Cheese Grating Rig are classic examples of our Community Registered Designs. For the consumer’s acceptability and perception of quality of meat and fish products, texture is crucial. Whole tissue and processed meats are often investigated to assess ideal combinations of ingredients, evaluate contribution of processing methods/times and highlight quality inconsistencies. The measurement issues are, however, different for each type of meat. Deli-style meats need to balance the binders and texturising ingredients to obtain perfect firmness, cohesiveness and low adhesiveness so that they can be easily cut. Formed meats need to balance moderate firmness with strong cohesion since these products are usually handled roughly but must remain whole. Many formed meats are often breaded so crispness is also a major textural attribute. For fish and fish products the issues of firmness, gaping, and the creation of surimi products with an authentic shell-fish texture that are barely distinguishable from the real thing present challenges. At each stage in surimi product development, production and quality control, food manufacturers can quantify textural parameters such as toughness, elasticity and gel strength using the TA.XTplus Texture Analyser. The effects of gel moisture content, salt concentration, cooking temperature and length of time heat is applied during processing are typical assessments which cut out the guess-work. A wide range of MEAT AND FISH PRODUCT test methods is built into Exponent Texture Analyser software and will automatically load at the click of a button. We help make your testing quicker to access and the analysis of your product properties already prepared for you. Over the years we’ve worked with top scientists and companies in the field to develop such fixtures as the Meullenet-Owens Razor Shear Blade for poultry tenderness measurement and the USDA Standard Warner-Bratzler blade for meat testing. No one knows more about the texture analysis of meat and fish products – but don’t just take our word for it, read an example of what our customers have to say. The pasta industry faces many innovative challenges driven by increasing consumer demand for premium products, health properties and an interest in more adventurous food. The development of wholegrain, gluten-free and fortified pasta in a multitude of shapes and sizes holds the potential to increase market share. Quality control methods with objective test equipment, such as the TA.XTplus Texture Analyser, are available to monitor the effect of ingredient quality and processing methods on cooked and uncooked product texture. We have developed a wide range of texture evaluation methods for use in near-line production or in R&D. The break strength and flexure of dried pasta and the tensile strength, firmness and stickiness of cooked pasta are typical examples of tests that have been developed for use as practical, fast and cost-effective quality control tools. Meanwhile, the almost universal usage of rice as a staple food makes it an obvious area for texture analysis testing, and the development of the Rice Extrusion Rig has been a typical response. 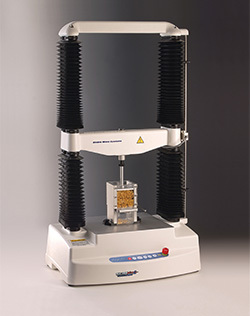 This rig allows the determination of rice kernel resistance to extrusion after cooking according to ISO 11747. A wide range of PASTA AND RICE PRODUCT test methods (including AACC and ISO Standards) is built into Exponent Texture Analyser software and will automatically load at the click of a button. We help make your testing quicker to access and the analysis of your product properties already prepared for you. When a test solution doesn’t exist we go ahead and develop it – the Triple Ring Cutting System, the Rice Extrusion Rig and Noodle Loop Tensile Rig are classic examples of our Community Registered Designs that provide new ways to measure pasta or rice texture. No one knows more about the texture analysis of pasta and rice products – but don’t just take our word for it, read an example of what our customers have to say. Profits are tight and competition is intense for animal feed manufacturers, so it’s now more important than ever that feed mixers and compounders focus on optimising their products and differentiating their offering from that of their competitors. Simply starting to use a new, expensive ingredient is not a decision that can be made quickly, and may not be possible at all in today’s economic climate. Improving economies of scale is valuable but challenging as competitors fiercely protect their own market share. The key lies in improving existing products and / or ascertaining the best ways to modify them. Animal feed must be carefully formulated to optimise both nutritional content and palatability – taste, smell and texture. The use of high quality ingredients is pointless if animals reject the feed. As a result, leading manufacturers already invest significant resources in determining the right combination of ingredients and processing techniques to develop their products. Sensory testing is a common element of this process – just as it is in foods for human consumption. Complementing this with objective instrumental analysis provides a comprehensive insight into feed palatability and therefore the likely commercial success of the product. A wide range of PETFOOD PRODUCT test methods is built into Exponent Texture Analyser software and will automatically load at the click of a button. We help make your testing quicker to access and the analysis of your product properties already prepared for you. Whether it's wet or dry catfood, dogfood or aquaculture feed, our instruments are extensively used in R&D and Quality Control environments. We are totally dedicated to help you develop the best tests for your product – but don’t just take our word for it, read an example of what our customers have to say. A wide range of PHARMACEUTICAL & MEDICAL PRODUCT test methods is built into ExponentTextureAnalyser software and will automatically load at the click of a button. We help make your testing quicker to access and the analysis of your product properties already prepared for you. Texture analysis, which has long been used by the pharmaceutical, food and cosmetic industries, is increasingly used to evaluate properties of medical devices. Texture analysis refers to such properties as firmness, adhesiveness, cohesiveness, tackiness and swelling as well as fatigue and relaxation behaviour or products. For many of these tests, standard methods lag behind product development. Typical measurements for the TA.XTplus Texture Analyser include the actuation force of an inhaler, the compressive strength of stents and contact lenses, the strength of medical adhesives and the firmness of breast implants. Regulatory agencies, including the FDA, have used the TA.XTplus Texture Analyser to evaluate medical devices. In addition, the patent literature increasingly relies on texture analysis as a quantitative tool to validate claims. The Texture Analyser by Stable Micro Systems is flexible and accurate with an easy calibration process for high precision measurements of single tests or cyclic testing of active implants such as diaphragms, pumps and switches. A wide range of MEDICAL DEVICE test methods is built into Exponent Texture Analyser software and will automatically load at the click of a button. We help make your testing quicker to access and the analysis of your product properties already prepared for you. Over the years we’ve worked with top scientists and companies in the field to develop such fixtures as the Metered Dose Inhaler. When the test solution didn’t exist we went ahead and developed it – the Universal Syringe Rig is a classic example of our Community Registered Designs. We are totally dedicated to the physical property measurement of medical devices – but don’t just take our word for it, read an example of what our customers have to say. A wide range of COSMETIC AND SKINCARE PRODUCT test methods is built into ExponentTextureAnalyser software and will automatically load at the click of a button. We help make your testing quicker to access and the analysis of your product properties already prepared for you. In a world full of mirrors and selfie sticks, we put a lot of stock in the way we look, with hair appearance often coming top of the list. It is no surprise, then, that haircare products take up an enormous part of the beauty industry. If they are to make the grade, today’s manufacturers have to achieve product consistency and high standards as well as novelty value and noticeable results that will keep consumers coming back for more. The science of texture analysis has numerous applications in the manufacture of haircare products. The TA.XTplus Texture Analyser, with its wide range of compressive and tensile capabilities, can apply specifically-designed test methods to assess an unrivalled array of physical properties. Not only do these test methods allow refinement of formulations and assessment of suitability of proposed packaging materials but they can also be used to validate claims about product performance by quantitatively testing the effects on hair itself. A wide range of HAIR AND HAIR PRODUCT test methods is built into Exponent Texture Analyser software and will automatically load at the click of a button. We help make your testing quicker to access and the analysis of your product properties already prepared for you. We are totally dedicated to the physical property measurement of your hair and hair products – but don’t just take our word for it, read an example of what our customers have to say.